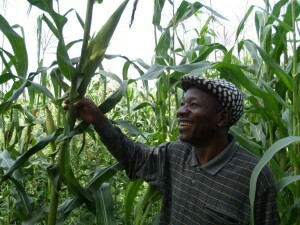 An A-Maize-ing impact on Maize crops thanks to Alliance Farming in North-West Cameroon! Violent conflict between farming and herding communities in North West Cameroon continues to be a critical issue. Scarce natural resources, ineffective government, and cultural and religious tensions continue to exacerbate the conflict, compromising small-scale agriculture in rural communities. As people are killed, crops and animals are destroyed and poverty ensues, Village Aid and our partner MBOSCUDA are striving to restore peace. Through our partnership, we are reaching out to the communities severely effected by the violent and continuous conflict. We’re inspiring them to start thinking differently about their issues. One of the outcomes of this is Alliance Farming. An innovative land management techniques that is promoting the benefits of working together to mutual multiple benefits. Alliance Farming is a simple land management technique where crop farmers and cow herders share their land to mutual benefit. Put simply, Cows graze on land after crops have been harvested and naturally fertilize it. Crops are then planted on more nutritious land so that they grow significantly better. Thanks to this basic technique, cow fertility and milk production are also significantly improved. 92 alliance farming partnerships have already been established in North West Cameroon, and we hope to facilitate many more over the coming years. Wasi is a crop farmer who has benefited from alliance farming. Wasi was regularly affected by the conflict and would never allow cows near his land before his involvement with the project. After meeting some farmers who’d benefitted from Alliance Farming, he set about finding a cow herder to share his land with. Like many farmers practicing this innovative land management technique, Wasi has seen vast improvement in his crops. On what he once thought was barren land, his Maize is growing a-Maize-ingly! You can find out more about this project, and our work in Cameroon here, or by calling us on 01629 814 434. PREVIOUSDialogue Platforms: Reducing conflict between Herders and Crop Farmers in North West Cameroon.